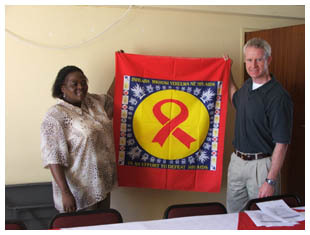 The ‘twinning’ began in October 2004 with a visit to Hampton, New Brunswick by Thandi Nhlengethwa, Executive Director of The AIDS Information and Support Centre (TASC), Swaziland. Ms Nhlengethwa told Hampton residents about the situation of HIV/AIDS in Swaziland, where 42.6% of pregnant women are HIV positive. Treatment for HIV in Swaziland is only available to a minority and the number of people dying from AIDS is climbing rapidly. Life expectancy has dropped from 57 years in 1990 to 33 years by 2005.It is not uncommon to find households of twenty children under the care of a single elderly grandmother. In the face of these almost un-imaginable challenges, many people in Swaziland are doing incredible work to take care of the orphaned and sick, or to work against the factors that make people vulnerable to HIV/AIDS. A group of Hampton residents has organized to support these efforts through a ‘twinning’ arrangement between the Town of Hampton and the Town of Piggs Peak. The spirit of this ‘twinning’ is that members of both communities have a great deal to gain from working together. In April 2005, Hampton resident Mark Bettle travelled to Piggs Peak to see the issues of HIV/AIDS first hand, and to strengthen the links between the Hampton and Piggs Peakpartners. He met with the Town Council and CEO, as well as leaders of the Church of Nazarene and Fundukuwela High School. Together they identified a number of specific projects to address issues of HIV/AIDS, and have since been planning and fundraising for these projects.